01 May 2018 --- There is strong evidence supporting salt reduction as a key public health strategy to lower blood pressure and reduce the risk of cardiovascular disease (CVD), reiterates a new review by Action on Salt (based at the Wolfson Institute, Barts & The London, Queen Mary University of London) published in Nature Reviews Cardiology. The review challenges some previously published studies, labeled by the lobby group as “of poor scientific quality,” which have generated controversy and cast doubt on the importance of reducing salt intake on public health. Titled “Role of salt intake in prevention of cardiovascular disease: controversies and challenges,” the researchers note that salt consumption has long been shown to have a negative impact on health, with studies of various types consistently showing a high dietary salt intake is the major cause of raised blood pressure. A high salt diet has been linked to a number of other conditions, such as osteoporosis, stomach cancer and kidney disease. Moreover, a raised blood pressure can lead to CVD (including strokes and heart failure), which is the leading cause of death and disability worldwide. The WHO has set a global target of reducing population salt intake from the current level of approximately 10g/day to <5g/day. This recommendation however, has been challenged by several studies suggesting a J-shaped relationship between salt intake and CVD risk – i.e. 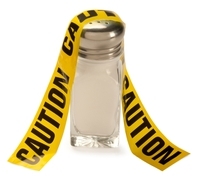 there is an increased risk of CVD with lower intakes as well as higher intakes of salt. The review highlights the severe methodological problems of these studies, such as reverse causality and measurement error due to poor assessment of salt intake via spot urine. Reverse causality often arises in studies where participants with pre-existing medical conditions, such as chronic kidney disease or diabetes mellitus, are recruited. These studies propose that a lower salt intake is associated with a higher CVD risk, when in fact the sick individuals are likely to eat less food and consume less salt due to their poor health, or may already have been advised to reduce salt intake. Therefore, the inverse relationship between lower salt intake and higher risk of CVD is likely to be due to the underlying disease, i.e., it is not the low salt intake that is causing their death, but rather their illness that is causing their low salt intake, the researchers say. Measurement error occurs in cohort studies that use a single spot urine sample to estimate an individual’s usual salt intake. However spot urine measurements are influenced by several factors, including the amount of fluid consumed and the amount of salt in the last meal they ate, and therefore do not reflect salt intake accurately. For studies investigating the association between salt intake and health outcomes, multiple nonconsecutive 24-hour urine collections are essential. To date, only three studies have assessed individuals’ salt intake using such methodology, and all showed a direct, linear relationship between salt intake and CVD risk. Gradual, stepwise salt reduction as recommended by the WHO remains an achievable, affordable, effective, and important strategy to prevent CVD worldwide. In most developed countries, salt reduction can be achieved by a gradual and sustained reduction in the amount of salt added to food by the food industry (i.e., reformulation). The UK has pioneered a successful salt-reduction program by setting incremental targets for >85 categories of food; many other developed countries are following the UK’s lead. Evidence for the effect of salt on health is similarly if not more robust than that for other dietary and lifestyle changes, such as eating more fruit and vegetables, increasing physical activity, and reducing smoking. What’s more, unlike these other factors, industry-led salt reduction via reformulation does not require individual behavior change and is more likely to be successful across the whole population, including the more socially deprived. From a public health perspective, salt reduction is one of the most cost-effective, feasible, and affordable measures to prevent CVD and other noncommunicable diseases (NCD), Action on Salt notes. “Studies of poor scientific quality have unfortunately tried to cause controversy in what is recognized as a robust public health strategy. However, the totality of evidence shows reducing our salt intake will be immensely beneficial in preventing strokes, heart attacks and heart failure, the commonest causes of death and disability in the world. The question is not ‘should’ we reduce salt intake, but ‘how,’” says Dr. Feng He, lead author of the Review and researcher at Queen Mary University of London.